Today, hospitals, group medical practices, and clinics face a significant challenge everyday - that of processing a large amount of EOBs or remittance paperwork on a daily basis which accompanies the payments received from insurance payers. On an average, more than 20% of the medical payments today are keyboarded manually due to the inability of payers to provide an electronic remittance advice (835/ERA) back to the providers. This in turn costs providers a lot of time and resources while forcing them to re-enter payments manually. This process, also known as payment posting, is very important as any wrong posting can result in inaccurate accounting, further causing problems down the line. Both ERAs and EFTs are technologically-advanced electronic tools which can help you save time and money. Let's have a look at them in detail. The healthcare industry implemented a standard, technically labeled ANSI 835, for electronic insurance payments and reconciliation just a few years back. 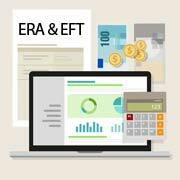 Both ERA and EFT are an integral part of this standard. While Electronic Funds Transfer (EFT) ensures insurance companies are able to deliver electronic healthcare payments to providers upon adjudication of valid claims, Electronic Remittance Advice (ERA) is generated as a standard report format which is then sent by insurance companies to providers as an explanation of payments made. Both these technologies together help to expedite the delivery of insurance payments while simplifying the overall procedure of reconciliation of patient accounts. Elimination of risks such as paper checks being lost, inaccurate credit deposits, etc. At O2I, we understand that payment posting is an integral part of medical accounts receivable services. We are acutely aware of the sensitivity of the whole process, and understand that an accurate and efficient process can help clients save on costs while increasing their operational efficiency. Want to know more about our time-tested and streamlined medical billing procedures? Contact us right away and reap the benefits of partnering with a truly global service provider.